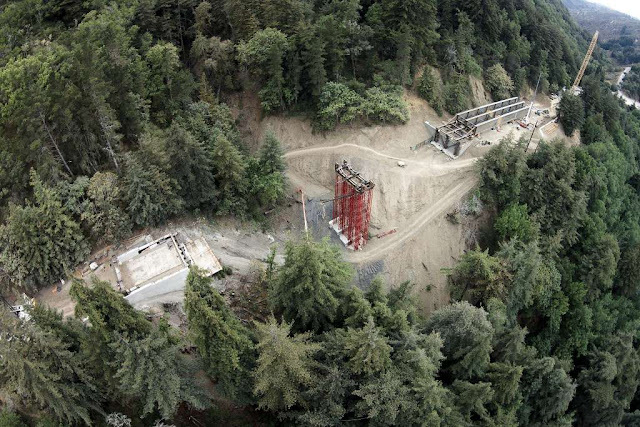 It was a year ago that I wrote about the landslide that damaged the Pfeiffer Canyon Bridge and the efforts to accelerate construction of the new bridge. The new bridge was completed in October, seven months after the 49 year old bridge was demolished. The old bridge had to be demolished first because the new bridge was build at the same location. 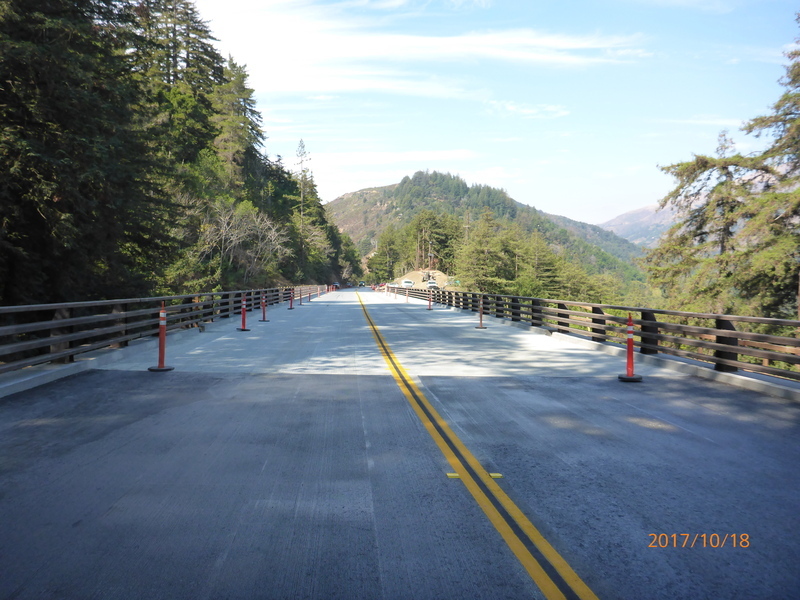 A video of the new bridge's construction is available from Caltrans. In the photo above we can see the superstructure being assembled from behind the abutment. The girders were built with enough camber to allow it to span half the distance before coming to rest on the temporary shoring before being dragged to the opposite abutment. 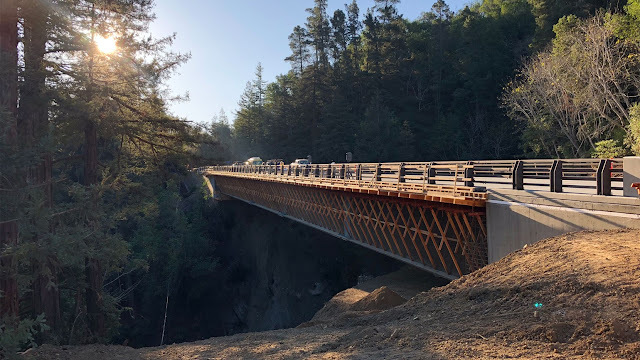 The replacement bridge is a single span 308 ft long steel girder bridge without piers, which will hopefully prevent future slides from impacting the bridge. Note the walkways (above) needed to allow the bridge to be painted and inspected. The new bridge cost $24 million and was built by the Golden State Bridge Company in Benicia California. The steel girders were fabricated in Vallejo California. 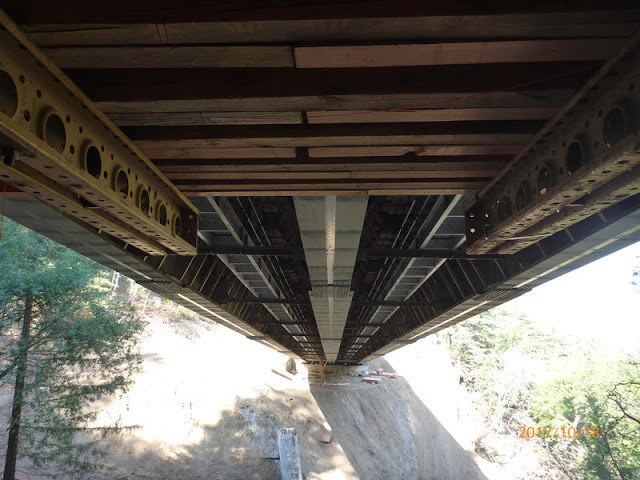 The bridge has a new bridge number (44 0298) and a bridge inspection was done on October 18th, even though the overhangs and abutments were still supported by falsework and the joint seals still needed to be installed (see top and bottom photos).